If ever you visit Whitby (north-east Yorkshire coast) and decide to visit the Abbey via the old town by climbing the 199 steps, allow extra time for window gazing. Most of the shop-windows offer tempting displays of jet new and antique. The small museum is well worth a visit. Whitby is one of the few areas in the world where the gemstone JET is found. The fossilized wood of a tree similar to the Monkey Puzzle, about 182 million years old, it is fairly firm yet soft enough to be carved into elaborate designs, faceted and polished creating works of art but mostly used for jewellery. The height of popularity was during Queen Victoria’s reign and the Edwardian period when mostly worn as mourning jewellery. In other eras worn for its own merit and beauty. Carving is a time consuming skill so very little is carved these days, relying on the mounts to enhance the jet. These items, clockwise from top left are: link from antique bracelet – carved flower spray motif, mourning brooch (original Edwardian photo of very handsome man now covered by Whithof lace); lucet rope & pendant had lock of hair, now carries Rosaline Lace; bird and ammonite brooches are modern; small pendant; snake bracelet is Victorian. Bracelet a ”thank you” after a telephone request to visit and show caller how to make lace – NO – house-bound – age 80 mentioned – “mother would like to have a try BEFORE IT IS TOO LATE” – I gave in – daughter was 80 – mother 103 – on TV as oldest person in England at that time!!!! A few bookmarks and small mats appeared before her sight went then bags of knitted clothes-hanger covers appeared. As usual the wool and material shops were almost emptied – some of us just could not resist acquiring more jet jewellery. Unbelievably for the seventh year running we had beautiful summer weather encouraging us to enjoy the sun as well as lace. This year we stayed for 4 days so it was decided to have the chance to explore needle made lace. Norma, an extremely talented member, offered to share her expertise, generously and patiently helping the adventurous explore a different lace. By Sunday quite a few petals had been produced using the Zele techniques. Looking forward to seeing the completed flowers. Thank you Norma. 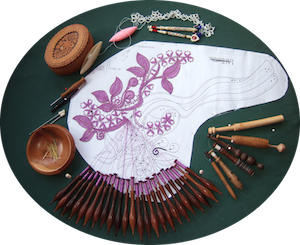 Our Australian member brought her Torchon Lace tablecloth – entirely her own design and work. A Ravenfield member brought her crocheted bedspread adapted from an old tray-cloth. A sister-in-law visitor from Canada almost finished a pair of socks. The rest either crossed & twisted onwards or relaxed with a change of craft. Thank you ladies for sharing your work and skill. A small aside – ever wondered why a “thimble” is so called? Really is a corruption of “THUMB BELL” as, if truly following continental methods, the needle is pushed upwards and away from you by using the thumb. Feels weird at first but I find you can control tension better this way – have a try – great fun. Norma’s needle lace samples and our usual display – useful when other visitors and the sisters, intrigued by our notice “Lacemakers at Work”, come to look see – bride (beautiful lacy dress) and wedding guests this year! Guess what? We are booked in for next year already!! !